History of the surname Spence. This very interesting name is of early medieval Anglo-Scottish origins. Introduced by the Norman French after the Invasion of England in 1066, it was a metonymic occupational surname for someone who was originally in charge of the pantry of a great house or monastery. The term derives from the pre 10th century Old French word “despense”, from the Latin “dispendere”, meaning to weigh out or dispense. In Chaucer’s “Canterbury Tales”, the glutton in the Sumner’s Tale is described as being “all vinolent as botel in the spense”. The modern surname can be found as Spence, Spencer, and the Scottish form Spens, Spenser and Despenser. The first recorded spelling of the family name is shown to be that of Simon del Spens. This was dated 1300, in the Charters of Guisburn Priory, Yorkshire. during the reign of King Edward 1st, known as “The Hammer of the Scots”, 1272 – 1307. Copyright: Name Orgin Research www.surnamedb.com 1980 – 2010. Pat Deasum from Canada sent the following information and request for help. August 2014. Email: deasum1@shaw.ca Message: Hi, I have a James Spence born in Laverton, Kirkby Malzeard Parish in 1776. I am trying to find out more information about him and wonder if you could provide any direction. He moved to Linton-on-ouse in the Newton-on-Ouse Parish in Yorkshire where he was an agricultural labourer. There he married Margaret (unknown). He had (1) children there, two who died. George (my ancestor b. 1803), Jane, James, Elizabeth, Thomas and Mary. George Spence (b. 1803) married Sarah Bates and lived in Arkendale. Their daughter Elizabeth (married John Whitling) and their daughter Ann married John GILL. Thanks so much for any direction you are able to provide. Best wishes, Pat in western Canada. Does anyone remember a Lily Coates, I believe she ran a pub in Ripon, who I believe was a great aunt of mine. Thank you. Carol sent this request in Jan 2012. Their decendent Sarah Lambert. Born, 1816, Ripon area. married James Spence. born 1812. Ripon Area. the Sticklands of Westmorland or Leeds. Peter Cockerill would like information about Thomas Spence, Shoemaker of Grewelthorpe from 1841 to 1881. Rose Hay is also interested in ancestors of James Spence b. 1812 the Cooper. If you can help please contact this site. Jean Greenwood would like information about James Spence b1812 Grewelthorpe and his children particularly John Spence born 1828. There has been a problem trying to contact Jean Greenwood. If she sees this will she please contact Carol Firth. Jenni Corner sent this comment. Robert Spence was born in your area in 1784 and his son John Foster Spence was a Mayor in North Shields. I’d be interested if anyone knows more about him. G. Hammond from Canada is seeking information about Elizabeth Spence[b.1801 d.1881] who married John Hammond. of Knaresborough in Ripon in 1822. Joan Malcouronne is seeking information re. Joseph Spence b1805 & his wife Elizabeth [b1816]. I am trying to trace information about my great grandmother Elizabeth Spence born 1842 in England. Her parents were Christopher John Spence and Elizabeth Christiana Davidson, who I believed married on 26.01.1837. If you have any information that would help me I would be greatful. Frances Hoffman of Canada is seeking information re James Spence b.1812. She writes [Dec 2012]. Dorothy Mary Steel, nee Whitley, was my 3x great-grandmother. She was born 1812 and died 1900. James was her second husband. I’m interested in connecting with descendants of James Spence – see below. JAMES SPENCE. Born 1812 Grewelthorpe. Son of Thomas the Farmer. Husband of  Sarah Lambert of Kirkby Malzeard and  Dorothy Mary Steel of Stockton. He was a cooper. Living Ripon 1871. Sarah Lambert died 1868. Letter from Barbara Phillips [Dec 2013]. JAMES SPENCE Born 1812 Grewelthorpe. Youngest of 7 children. Son of Thomas & Betty Matson. Other siblings. Mary 1795. John 1799. George 1801. Thomas 1803 – 1865. William 1805. Elizabeth 1808. Jane 1810. Thomas 1803 was a publican lived & died Grewelthorpe. The following information about the Spence families of the Grewelthorpe area have been taken from census returns, parish registers etc. AMELIA SPENCE. Born C 1871 Sowerby. Dau of William & Sarah. ANN SPENCE. Born C.1768, Lived Bull Ings. Buried 8.12.1838 Kirkby Malzeard. ANN SPENCE. Born C. 1861 Ramsgill. Living with her married sister Mary Atkinson. in Ilton in 1891. ANNIE SPENCE. Born 28 Aug. 1972. A widow. General & Poultry farmer at Hill Top Farm Grantley in 1939. ANNIE SPENCE. Born C.1873 Ripon. Dau of Thomas & Harriett. Teacher in Ripon 1891. ARTHUR A. SPENCE. Born 6 May 1882. Married to Anne. Living Snape Bedale in 1939. BESSY [ELIZABETH] SPENCE. Born C. 1816 Grewelthorpe. Married to Joseph. Widow & laundress in 1891 living in Kirkby Malzeard with son Richard. CHRISTOPHER SPENCE. Born 1750. Son of George Thomas & Anne Midgley. Married Dorothy Atkinson. Father of Thomas. Lived Grewelthorpe. CHRISTOPHER SPENCE. Born 12.2.1817 Grewelthorpe. Buried 31.1.1888 Grewelthorpe M.I.Husband of Mary Ann of Hull. Servant to General Cecil Wray Dalton. of The Hutts, Grewelthorpe. in 1871. CHRISTOPHER SPENCE. Bap. 21.6.1828 Aldfield. Son of George & Margaret. CHRISTOPHER SPENCE. Born C1851 Ripon. Son of James [cooper] & Sarah Lambert. CHRISTOPHER SPENCE. Born C 1860 Notts. Son of Christopher & Mary Ann. Living Grewelthorpe 1871. CYRIL C. SPENCE. Born C. 1875 Ripon. Son of John & Sarah Barker Orton married Sarah Bland. [b.1868 Knaresbro] the sister of his step Mother Mary Bland. DAVID SPENCE. Bap. 3.7.1859 Kirkby Malzeard. Son of Joseph & Elizabeth. Possibly the David Spence who worked for William Baul of Grovedale. See the Baul page. DAVID RALPH SPENCE. Born C 1865 Sowerby. Son of William & Sarah of Sowerby. DOREEN LILIAN SPENCE [Nee Caygill]. Born C. 1931. Died 8.10.1010. had lived in Mickley. Wife of John T. [Jack]. Married 1954. Mother’s maiden name Bilton. DORIS A. SPENCE. Born 2 Nov. 1903. Dau of Annie. Unmarried Poultry farmer at Hill Top Farm Grantley in 1939. DORIS SPENCE. Born 20 Aug. 1916. Dau of Matthew & Eleanor of Tom Corner. Later married ? Lobley. EDMUND SPENCE. Born C. 1872 Ripon. Son of John & Sarah Orton. ELIZA SPENCE. Born C. 1859 Ripon. Dau of James & Sarah Lambert. Living in Ripon 1871. ELIZA SPENCE. Born C. 1862 Bilton Harrogate. Wife of John the plumber. ELIZABETH SPENCE. Born C. 1757. Lived Grewelthorpe. Buried 16.5.1839 Kirkby Malzeard. ELIZABETH SPENCE. Born C. 1774. Lived Grewelthorpe. Buried 17.1.1845 Kirkby Malzeard. age 77. ELIZABETH SPENCE. Born C1801 Ripon Died 1881. Married John Hammond. [Shoemaker of Knaresborough] on 24.4.1822 in Ripon. Lived in Darlington. Had 9 children in 1861. ELIZABETH SPENCE [nee ?]. Buried 24.1.1804 Grewelthorpe. She was a widow. ELIZABETH SPENCE. Born 1808. Dau of Thomas & Betty Matson. ELIZABETH SPENCE. Born 1816. see Bessy. ELIZABETH SPENCE. Born C1837 Leyburn. Dau of James [Tailor] & Mary. ELIZABETH SPENCE. Born 1841. Grewelthorpe. Buried 5.7.1841 Kirkby Malzeard. ELIZABETH SPENCE. Born C1848 Ripon. Dau of James [Cooper]of Grewelthorpe and Sarah Lambert. Married ? Dolphin. had 2 children Laura & Sydney in 1881. ELIZABETH SPENCE. Born C. 1888 Ripon. In 1911 she was a domestic servant in Grewelthorpe with the Grundy family. ERIC SPENCE. Born 15 April 1911. Son of Matthew & Eleanor of Tom Corner. General Lab. FREDERICK W. SPENCE. Born 31 Oct. 1908. Son of Thomas [varnish manf.] & Margaret. Commercial traveller in 1939. living Ripon. GEORGE THOMAS SPENCE. Born 1713. & Died 1757. Kirkby Malzeard. Married to Anne Midgley in 1730 in Bedale. GEORGE SPENCE. Born 1801. Son of Thomas & Betty Matson. GEORGE SPENCE. Born C 1815. Son of Thomas [publican] & Ann. He was an apprentice cooper in 1841. in Grewelthorpe. GEORGE SPENCE. Bap.16.5.1830 Aldfield. Son of George & Margaret. GEORGE SPENCE. Born 15.3.1853 Grewelthorpe. Buried 13.3.1894 Grewelthorpe M.I. servant at Shaw’s Farm Masham in 1891. HANNAH SPENCE. Born C1834. Dishforth. Wife of John. Schoolmistress at Marton le Moor in 1881. HAROLD SPENCE. Born C 1898 Bilton Harrogate. Son of John & Eliza. HARRIETT SPENCE. Born C. 1841 Ripon. Wife of Thomas the joiner. HARRIETT SPENCE. Born C.1877 Ripon. Dau of Thomas & Harriett. ISABELLA SPENCE. Dau of George of Azerley. Married on 6.8.1855 at Kirkby Malzeard church to William Cartman. son of Anthony of Azerley. JAMES SPENCE. Born 1812 Grewelthorpe. Son of Thomas the Farmer. Husband of  Sarah Lambert of Kirkby Malzeard and  Dorothy Mary Steel nee Whitley of Stockton. He was a cooper. Living Ripon 1871. Sarah Lambert died 1868. Dorothy b1812 d.1900. See letters from Frances Hoffman & Barbara Phillips above. JAMES SPENCE. Born C1814 Spennithorne. A Tailor in Leyburn in 1851. married to Mary of Gilling. JAMES SPENCE. Born C 1840 Leyburn. Son of James [Tailor] & Mary. JAMES SPENCE. Born 1849. Ripon. Son of James & Sarah Lambert. James was a wood turner. Married Jane Blackburn. in 1870. JANE SPENCE [Nee ?]. Buried 5.10.1731 Kirkby Malzeard. Wife of William of Azerley. JANE SPENCE. Bap. 3.2.1810 Kirkby Malzeard. Died 1850 Dallowgill. Dau of Thomas & Betty Matson. Married John Cundall. on 20.11.1833 Kirkby Malzeard. Witness Ann Baul. Had 8 children. JANE SPENCE. Born 8.5.1840 Grewelthorpe.Died 1.5.1924 Ripon. Married Robert Horner. ..Mickley on 19.7.1864. [see Horner page] Possible the dau of James [cooper] & Sarah Lambert. JANE SPENCE. Born C. 1843 dau of Joseph & Elizabeth of Kirkby Malzeard. Married on 25.1.1868 at Kirkby Malzeard church to Simon Morland. [b.1844] son of Simon Morland. of Norton le Clay. JANE SPENCE. Born C. 1853 Ripon. Grand dau. of Aaron & Jane Musgrove living in Kirkby Malzeard in 1861. JANE SPENCE. Born C.1863 Dau of William of Kirkby Malzeard. Married on 4.7.1885 at Kirkby Malzeard church to George Teale. [b.1851] son of Joseph Teale. George was a groom. JENNY MAUD SPENCE. Born C1876 Dallowgill. Dau of Matson & Jan Elizabeth. JENNIE SPENCE. 14 Sept 1913. Dau of Annie [born 1872] Unmarried poultry farmer at Hill Top Farm Grantley in 1939. JOHN SPENCE. Born C. 1766. Buried 21.10.1846 age 80 in Kirkby Malzeard. JOHN SPENCE. Born 1799. Son of Thomas & Betty Matson. JOHN SPENCE. Buried 4.4.1802 Grewelthorpe. Son of John Spence. Report in Bradford Observer June 1836. Not sure which John this refers to. West Riding Sessions at Skipton. John Spence for stealing at Kirkby Malzeard a piece of ham belonging to John Beck and also stealing at Grewelthorpe a quantity of wearing apparel, the property of William Kirby Found guilty and transported for 7 years. JOHN SPENCE. Born C.1819 Kirkby Malzeard. Shoemaker. Married to Lavinia from Lincolnshire. JOHN SPENCE. Born C1824 Leyburn. In 1851 he was the Innkeeper at The Green Tree. Married to Ann of Leyburn. JOHN COWPER SPENCE. Bap. 30.5.1824 Aldfield. Son of Christopher & Catherine of Fountains. JOHN SPENCE. Born C1835 Leyburn. Son of James [Tailor] & Mary. In 1851 he was a tailors apprentice. JOHN SPENCE. Born C. 1835 Grewelthorpe. Possibly the son of Joseph & Elizabeth. Farm Lab. Husband of Hannah of Dishforth. Living Marton le Moor 1881. JOHN SPENCE. Born 1838 Grewelthorpe. Died March 1926. 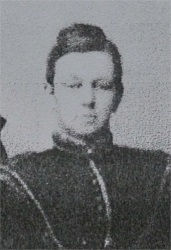 Son of James & Sarah Lambert. He was a Timber Merchant. Husband of  Sarah Barber Orton. [b.1833 Kirkby Malzeard]. Married 31.8.1861. Mary Bland. Married in Knaresbro 1897. Mayor of Ripon. See Photo at end. Mary Spence nee Bland. [1864-1940] Wife of John Spence. JOHN SPENCE. Born C. 1859 Grewelthorpe. Husband of Eliza of Bilton. Plumber & Painter in New Park, Bilton, Harrogate in 1891/1901. JOHN GEORGE SPENCE. Born C. 1878 Kirkby Malzeard. Son of John [The shoemaker] & Lavinia. JOHN T. SPENCE. Born in 1930’s. Married 1954 to Doreen Lilian Caygill. Lived Mickley. JONATHAN SPENCE. The Father of Sarah who married George Lofthouse [see Lofthouse page] left a will dated 31.12.1779. Proved in Masham Peculiar Probate court 3.6.1783. he mentions his son in law George Lofthouse. JOSEPH SPENCE. Born C 1804 Grewelthorpe. Son of Mary [bC1786] Husband of Elizabeth [Bessy] [b.1816] of Sutton. Living Grewelthorpe in 1841. Kirkby Malzeard 1861/71. JOSEPH SPENCE. Born C1853 Ripon. Son of James [cooper] & Sarah Lambert. LESLIE J.SPENCE. Born 15 July 1899 Ripon. Son of John & Mary Bland. Married to Agnes [born 1908]. She was an ARP warden in Ripon in 1939. Leslie was a timber merchant in Ripon. LUCY ELIZABETH SPENCE. Born C 1857 Notts. Buried 5.5.1875 Grewelthorpe M.I. Dau of Christopher & Mary Ann. Living Grewelthorpe 1871. MARGARET SPENCE. of Grewelthorpe. Married Giles Mitchell. of Burneston on 29.11.1684. MARGARET SPENCE. Born 1843. Buried 17.3.1844 Kirkby Malzeard. MARGARET A. SPENCE. Born C1843 Leyburn. Dau of James [Tailor] & Mary. MARGRET SPENCE. Born C.1880 Bilton, Harrogate. Niece of John the plumber. MARIA SPENCE. Bap. 9.6.1851 Kirkby Malzeard. Dau of Joseph & Elizabeth. MARJORIE SPENCE. Born 30 April.1907. Dau of Thomas [varnish manf.] & Margaret. MARK SPENCE. Born C 1856 Ripon. Son of James & Sarah Lambert. A cooper like his Father. MARY SPENCE. Married *Anthony Dawson. * in 1723 at Kirkby Malzeard. He was from Azerley. Born 1698. John Ascough of Ripon. MARY SPENCE. Born C. 1752. Lived Kirkby Malzeard. Buried 1.1.1837 K.Malzeard. MARY SPENCE. Born C1786. Kirkby Malzeard. Died 1878 in Keighley.Dau of George Spence of Fewston. & Anne Leuty. In 1841 in Grewelthorpe with Joseph & family. Unmarried. 1851 a pauper in K.Malzeard. 1861 living with son Joseph. in Kirkby Malzeard. MARY SPENCE. Born 1795. Dau of Thomas & Betty Maton. MARY DOROTHY SPENCE. Born C 1820 Darlington. Wife of James the cooper. Living Ripon 1871. MARY ANN SPENCE. Born C1823 Hull. Wife of Christopher servant at The HUtts, Grewelthorpe. MARY SPENCE. Born C. 1846.Kirkby Malzeard. Dau of Joseph & Elizabeth. Married James Ingram Ellis. of Kirkby Malzeard. MARY SPENCE. Born C 1855 Ripon. Dau of James [cooper] & Sarah Lambert. MARY SPENCE. Born 1859 Pateley Bridge. MARY SPENCE. Born C. 1862 Ramsgill. Married Thomas Atkinson. Living Ilton in 1891. MARY SPENCE. Born C 1867 Sowerby. Dau of William & Sarah. MARY SPENCE. Born 1875 Ripon. Dau of Thomas & Harriett. Drapers apprentice in Ripon in 1891. MATSON SPENCE. Born C1851 Studley. Husband of Jan Elizabeth of Dallowgill. Butcher & Cattle dealer. Living Grewelthorpe 1881. Report in York Herald. May 1879. Matson Spence Cattle Dealer of Grewelthorpe was summoned for ill treating a cow by neglecting to have her milked. Fined £1 including costs. Report in Knaresborough Post 1880. Matson Spence and David Richmond were summoned for using a gun without a license to kill game. They were both fined £1 and costs. MATTHEW SPENCE. Born C1796 Fingall. Boot and shoe maker in 1851 in Leyburn. Married to Mary of Barton. Had 2 children William & Alice in 1851. MATTHEW J.SPENCE. Born 4 Feb. 1874. Dairy farmer at Tom Corner. Married to Eleanor [born 1877]. REGINALD SPENCE. Born 1899. Ripon. Son of John & Mary Bland. RICHARD SPENCE. Born C. 1767. Lived Carlsmoor. Buried 21.8.1837. Kirkby Malzeard. RICHARD SPENCE. Bap. 19.6.1853 Kirkby Malzeard. Son of Joseph & Elizabeth [Bessy]. Living K.Malzeard, unmarried. Classed as an imbicile in 1871 and a labourer in 1891. SARAH SPENCE. Born 1718 Linterstone. Died Dallowgill. Married George Lofthouse. 1741. SARAH SPENCE [nee Barber Orton]. Born C. 1835 Ripon. Wife of John the timber merchant & Mayor. SARAH SPENCE. Born C1848 Ripon. Dau of James [Cooper] & Sarah Lambert. SARAH SPENCE. Born 11 Feb. 1864. A widow living Low Laithe in 1939. SARAH ELLEN SPENCE. Bap. 4.2.1877 Dallowgill. Dau of John Matson & Jane Elizabeth. STEPHEN HAROLD SPENCE. Bap 26.11.1880 Grewelthorpe. Son of John Matson [The Butcher] & Jane Elizabeth. THOMAS SPENCE. Buried 17.9.1721 Kirkby Malzeard. Lived Azerley. THOMAS SPENCE. Born C. 1767. Buried 24.3.1854 Grewelthorpe. [Ref. Par.reg.] Son of Christopher & Dorothy Atkinson. Married to Elizabeth Matson. THOMAS SPENCE. Born C1803. Died 1865. Son of Thomas & Betty Matson. Publican in Grewelthorpe in 1841. Married to Ann. had son George who was a cooper. THOMAS SPENCE. Born C1836 Spennithorne. Errand boy in Leyburn in 1851. THOMAS SPENCE. Born C.1843 Grewelthorpe. Grandson of James & Sarah Lambert. Husband of Harriett Hebden. Joiner & Cabinet maker in Ripon 1891. THOMAS SPENCE. Born C 1855 Notts. Son of Christopher & Mary Ann. Living Grewelthorpe 1871. THOMAS H.SPENCE. Born C. 1871. Ripon. Son of Thomas & Harriett. A cooper living Ripon 1891. THOMAS SPENCE. Born 27 June 1878. Married to Margaret [born 1878], A varnish manufacturer living Ripon in 1939. THOMAS SPENCE. Born 1883 Ripon. Son of James the wood turner & Jane Blackburn.. Married Sarah Ellen Goodyear Britton Shackleton. in 1906 in Leeds. Alderman Thomas F.H. Spence. Lived at Red Hill Grange. He donated Quarry Moor to Ripon. He was Mayor of Ripon from 1927 to 1929. In 1930 he was put forward as a Progressive candidate for the Council elections. He was the Managing Director of the Varnish Works T.R. Williamsons in Ripon. He was a member of the Liberal party. and was Chairman of the Ripon Division of the Liberal Association. WILLIAM SPENCE. Born 1805. Son of Thomas & Betty Matson. WILLIAM SPENCE. Born C. 1808 Grewelthorpe. Widower living Pickhill in 1891. WILLIAM SPENCE. Born 1838 Swetton. Buried 19.9.1838 Kirkby Malzeard. WILLIAM SPENCE. Born C 1841 Grewelthorpe. Possibly the son of Joseph & Elizabeth. Husband of Sarah of Sowerby. A grocer’s porter in Sowerby in 1871. WILLIAM SPENCE. Born C1845 Leyburn. Son of James [Tailor] & Mary. WILLIAM SPENCE. Born C1846 Ripon. Son of James [Cooper] & Sarah Lambert. In 1861 he was a bobbin turner. WILLIAM SPENCE. Born C. 1869 Thirsk. Son of William & Sarah of Sowerby. WILLIAM SPENCE. Born 21 Nov 1879. Married to Eleanor [born 1879]. He was a wheelwright & Cartwright Living Fearby in 1939. Excerpt from History of the Unicorn Hotel, Ripon. During this period the Unicorn was famous for a character known as Tom Crudd or “Old Boots”. His real name was Thomas Spence. “This extraordinary person was favoured by Nature with a nose and chin so enormously long, and so lovingly tending to embrace each other, that he acquired by habit the power of holding a piece of money between them.” Being a servant of the Unicorn Inn in Ripon, Yorkshire, it was his business to wait on travellers who arrived there, to assist them in taking off their boots. He usually introduced himself in the room with a pair of slippers in one hand and a boot jack in the other. “The company in general were so diverted with his odd appearance that they would frequently give him a piece of money on condition that he held it between his nose and chin. This requisition he was always ready to comply with, it being no less satisfactory to himself than entertaining to them”. Photo submitted by Jean Greenwood. JOHN SPENCE. of Ashley House, Ripon. son of the late Mr. James Spence. was born at Grewelthorpe on Nov. 6th 1838 and educated at Mr J.Dunnington’s private school. He was in business in Ripon as a timber merchant. Various branches of the Spence family have been connected with the muncipal life of Ripon for centuries. John was a member of the Council from 1873 to 1879 when he did not seek re-election. 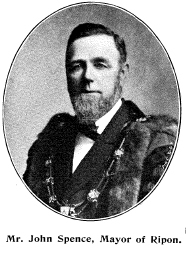 he was chosen as Mayor from outside the Council in 1900 and re-elected as Mayor for the Coronation Year in 1901. On both occasions unanimously. He was for a number of years a member of the Ripon Board of Guardians and Rural Sanitary Authority, a Church warden of the Cathedral, and a trustee of various institutions connected with the city. he was Hon. secretary of the Ripon Agricultural Association and a practical agriculturist. Photo by courtesy of youroldbooksandmaps.co.uk. Article in the Yorkshire Gazette April 1888.
hatched a fine gosling, which had 4 perfect legs, 2 black and 2 white.